At the end of August, La Tomatina festival is held in Spain and because MyHOSTpitality wants you to learn languages, there’s no better way than to attend to festivals where people from all over the world go. La Tomatina is a festival that is held in Buñol, a town from the Valencian Community. Buñol celebrates its festivals at the end of August and this one appeared during the festivities of 1945, while some young people watched in the town square the parade of giants and big headed. These youngsters wanted to be part of the parade, but a participant got angry and started to hit everything in his way. In the square, there was a stand of vegetables and people got mad and started to throw tomatoes at each other until the police put an end to the whole mess. That tomato war became so popular that the next year youngsters decided to bring their own tomatoes. Despite the attempts by the police to stop that tomato war, those youngsters made history. La Tomatina was forbidden at the beginning of the 50’s, but because of the villagers’ intentions to keep that tradition, in 1957 they decided to celebrate the tomato burial. It consisted on a manifestation from the neighbours where would bury an enormous tomato inside a coffin. They arranged a parade where a musical band played funeral marches. The tomato burial was a success and since then La Tomatina was imposed as an official festival. La Tomatina became that popular in the rest of Spain when it appeared on TV, in 1983. Since then, each year there’s, even more, participants that attend the festival, that’s why in 2002 it was declared as a festival of International Tourist Interest by the General Tourism Secretary. 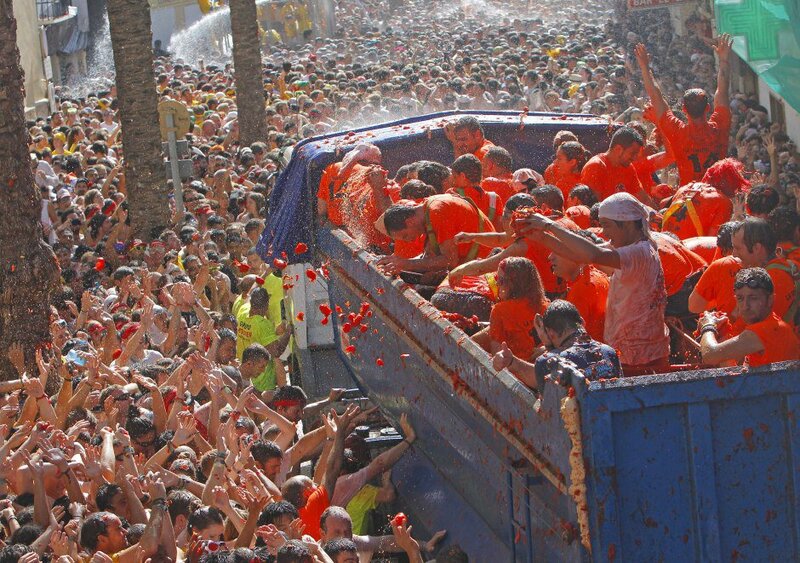 La Tomatina doesn’t have a fixed celebration day, it is celebrated on the last Wednesday of August, which corresponds with the festivities of Buñol. This festival begins at 11 AM with a rocket being set off and finishes at 12 AM with another rocket. The participants throw tomatoes at each other for an entire hour. The most important rule that no one must never forget is that, before throwing the tomatoes, the participants have to crush them so they don’t harm anyone. Besides, when they hear the shot of the second rocket, the one that puts an end to the celebration, everyone must stop throwing tomatoes. La Tomatina is celebrated in the town square of Buñol, an original, colourful and sticky festival where the protagonist is one of the main ingredients of the Spanish Mediterranean diet, the tomato. Six trucks distribute around 150 tonnes of tomatoes which neighbours take charge of delivering them to all participants. It’s a war where nobody wins and nobody loses, where everything is tinted in red. There’s no typical outfit but people usually bring diving goggles. Before the war begins, they put a big and tall stick smeared with oil and soap so it slips and at the end of that stick there’s a ham. Whoever gets to the end of the stick, keeps the ham as a prize. La Tomatina is one of the most attractive Spanish festivals for tourists of different nationalities that are fun lovers. La Tomatina is that successful that it has spread to Argentina, Costa Rica, Colombia, China, Chile and South Korea. Due to a total participation of 50.000 people in 2012, the mayor of Buñol decided to charge 10€ for the entrance to all participants and reduce the capacity, because of an avalanche risk. But previously booking some tickets to nearby neighbours in town. With La Tomatina festival, appeared the Tomatina Sound Festival, a summer music festival that accompanies one of the most important international festivals, it’s a total of a two-day concert. It begins the previous day to La Tomatina, so people attend without sleeping. The festival continues after La Tomatina. It appeared recently but it seems that it will keep ongoing for a long time. La Tomatina is such an important festival that attracts attention, both at a national and international level, that it’s quite difficult to find a place to stay. If you have decided to attend on deadline or you find hotels too expensive, don’t you worry, MyHOSTpitality can help you. Look in our community for hosts nearby Alicante and become a guest. To do so, you have to exchange your native language for an accommodation. Don’t miss the opportunity to attend this great festival.